Companies in the Madison Region have access to the right resources, expertise, and infrastructure to pursue global growth opportunities. As a global leader in several key industry sectors, the Madison Region provides a concentrated network of tools, talent and technical assistance, making our eight counties a clear choice for businesses looking to take advantage of international growth opportunities. Companies headquartered in the Madison Region that do business worldwide include Promega, ABS Global, Epic Systems, Synergy Metalworks, Animart, Hufcor and Kuhn, while international companies that have found U.S. expansion success in the region include Kerry Ingredients (Ireland), Emmi Roth (Switzerland), Saint-Gobain (France) and Fiskars (Finland). The University of Wisconsin – Madison makes a strong partner for Foreign Direct Investment opportunities, thanks to its world-class research & development capacity. With more than $1.1 billion per year in academic R&D, UW-Madison consistently ranks among the nation’s top five academic institutions in both research expenditures and patent generation. UW-Madison faculty, students, and labs regularly partner with industry to research, prototype, and test new ideas, ultimately playing a key role in technology transfer and commercialization. Global businesses in the Madison Region are served by infrastructure that supports and expedites exports. In 2005, Dane County Regional Airport (MSN) created Foreign Trade Zone No. 266 to encourage, facilitate, and accelerate international trade in the region. FTZs provide exemption, delayed or lowered tariffs and duty payments to manufacturers and processors, reducing competition with foreign companies. Milwaukee, located 35 miles from the Madison Region’s eastern border, serves as the major shipping port for the region as well as the state, and is also home to Foreign Trade Zone No. 41. 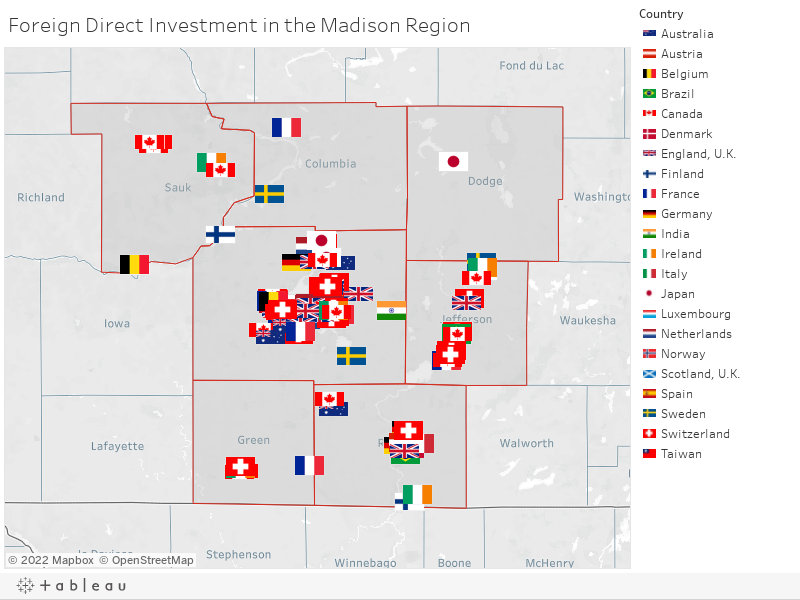 MadREP and its partners are well equipped to leverage the Madison Region’s assets around the world. MadREP has formed an International Steering Committee, comprised of a dozen experts from state agencies, legal and financial institutions, and private industries, to implement a plan for increasing the region’s exports and foreign direct investment. Regional partners like the Madison International Trade Association provide global know-how and resources to companies, delivering vital global and international trade information to businesses looking to expand their international reach. Wisconsin Manufacturing Extension Partnership (WMEP) collaborates with the Wisconsin Economic Development Corporation and the Northwest Wisconsin Manufacturing Outreach Center to provide ExporTech™: an export acceleration program using a proven method to develop or expand an export program. The Wisconsin Economic Development Corporation excels at helping companies grow beyond Wisconsin’s borders. The state has a global network of foreign trade representatives who represent 79 countries and can provide in-country expertise and resources in some of the world’s fastest growing markets. Learn more about the many exporting programs available through WEDC, including trade ventures and exporting grants. Wisconsin is at the center of America—and at the center of what makes America a great place to do business. Our unique location, hardworking people and positive policies work together to make Wisconsin the perfect U.S. hub for your company. Learn more about Foreign Direct Investment in Wisconsin. With most of the world’s consumers living outside the U.S., trade exports play an increasingly important role in economic growth. In 2015, Madison and Janesville-Beloit MSA exports totaled $2.28B and $966M, respectively.